others have formed Forum for IT Employees in Pune. PUNE: Following the layoffs in various software firms, employees working in information technology (IT) industry have formed a union in Pune. 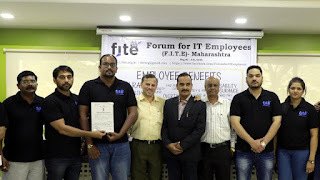 Forum for IT Employees (FITE) announced its registration as Maharashtra's first trade union for employees in the IT sector. The newly formed trade union received registration number PN4845 under the Trade Unions Act, 1926. The union has already has received 5,000 online registrations and over 150 registrations in person, said its office-bearers. This is the second union for IT employees in the country, second to Karnataka State IT/ITES Employees Union (KITU), Bengaluru. “The Bengaluru union was formed in line with a political party. FITE is the first independent IT employees' union formed and run by the IT employees," said Elavarasan Raja, general secretary of FITE. Pavanjit Mane was appointed as the president of FITE while Padmaja Pawar and Vivek Mestry were elected as vice-presidents, Harpreet Saluja and Basanagouda Patil as joint secretaries, and Velkannan was appointed as the treasurer. "FITE is a collective that works across regions of the country and is in the process of consolidating its efforts. We thank our members and leadership teams and look forward to being registered in multiple states in the near future,” a statement from FITE reads. Prior to its registration, members of FITE who had been affected by retrenchment had approached the labour commissioner and subsequently the labour court. "When reconciliation at labour commissioner's office fails, the case is moved to the labour court which has the powers to grant interim relief as well as reinstatement to the affected employees," said advocate Anoop Awasthi, who is representing the employees in the court. Currently, 17 cases are pending in the court while 72 are in the process of reconciliation at the Pune labour commissioner's office. As a union, FITE has shown resolve to tackle the problem of blacklisting and negative feedback which is rampant in the IT industry, according to the members present at the announcement event. "The issue of blacklisting needs to be highlighted and dealt with. It is anti-democratic and illegal. Nasscom (National Association of Software and Services Companies) refuses to even recognise the existence of this list," said Girish Bhave of Lok Raj Sanghathan. Along with Bhave, Dilip Pawar, head of Bajaj Auto Union and Shramik Ekta Mahasangh has pledged his support to FITE in order to spread their reach and form committees in every company. The recognition of the union by companies was described as an ‘uphill task’ by Mane, the president of FITE.